Each with her own charm. ​Each lets you hit Park City, Canyons Village or Deer Valley. Lucky you. ​Meet Betty, Sheila, Roxy, Lola & Buffy. ​Each has her own special appeal. Each offers an opportunity to vacation with those special friends, extended family or your favorite group of ski pals. And most are just a short walk (yes, walk) to the lift at Canyons Village at Park City Mountain Resort. All five are right near the bus stops for the free Park City shuttle, so you can easily reach any resort, restaurant, bar, or pretty much any place else you want to be in Outside Magazine's "Best Town in America." Roxy is a three-story, three-bedroom townhome that sleeps as many as nine. 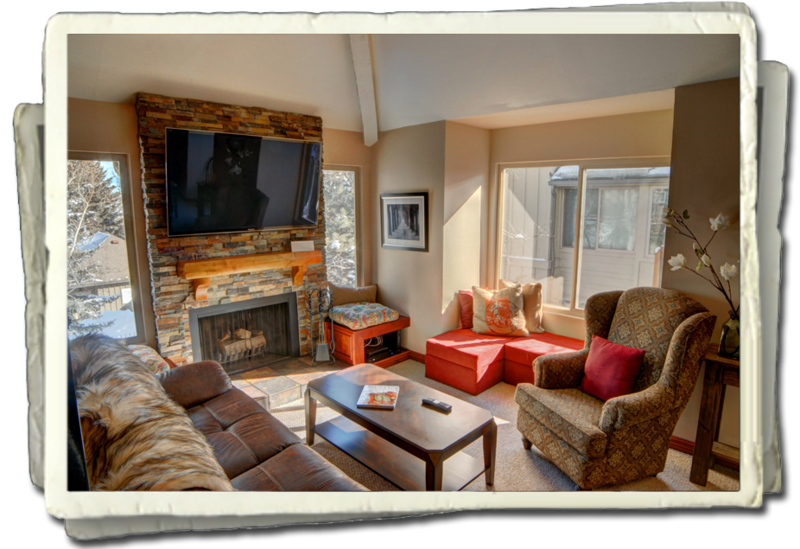 Two fireplaces, a full kitchen, and a cute deck with gas grill make for an ideal ski vacation rental. The easy walk to Park City's Canyons Village gives you immediate access to more acres of skiable terrain than any other resort in the country. 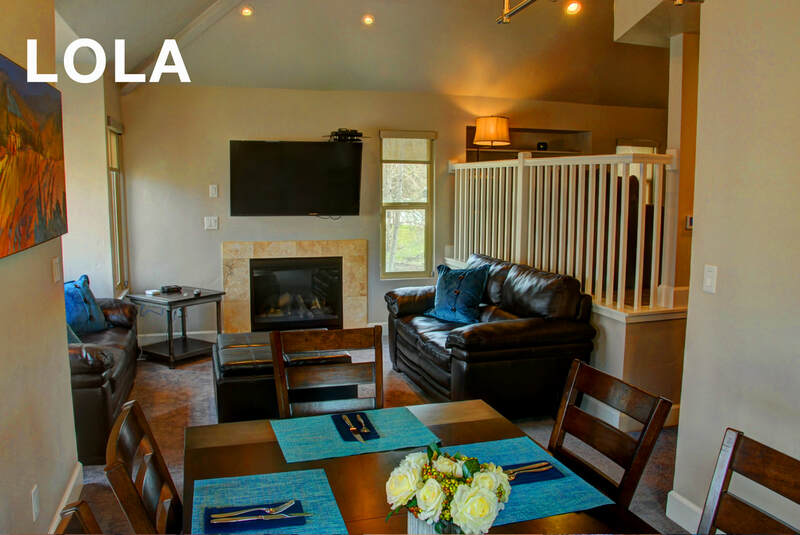 Lola is a three-story, two-bedroom townhome that sleeps as many as eight. 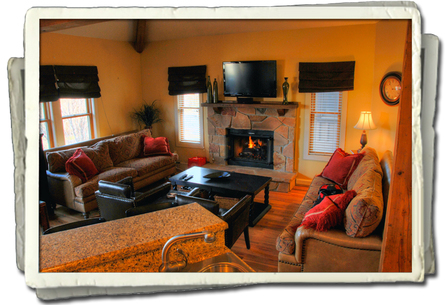 A living room fireplace, a full kitchen, den, loft and deck with spa make for an excellent ski vacation getaway. Lola is also an easy walk to Park City's Canyons Village The Cabriolet lift or the Frostwood Gondola at the Waldorf can carry you to all that snow in a hurry. 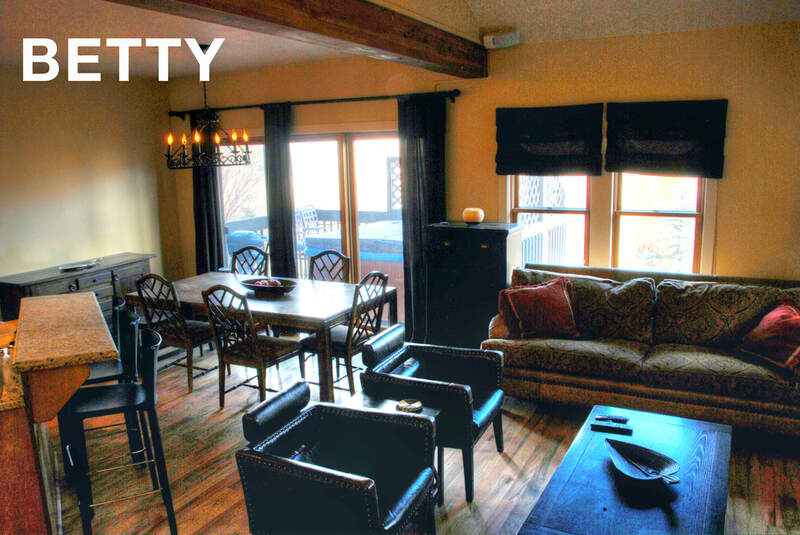 Betty is a three-story townhome featuring two fireplaces, a private hot tub, lower level den, full kitchen, and multiple mountain views. 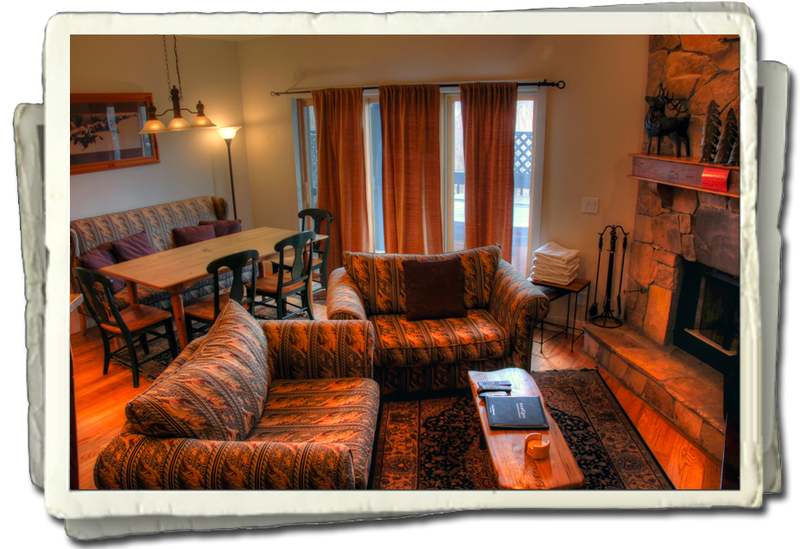 She's a great vacation rental for a big group, sleeping as many as 13 adults & kids. 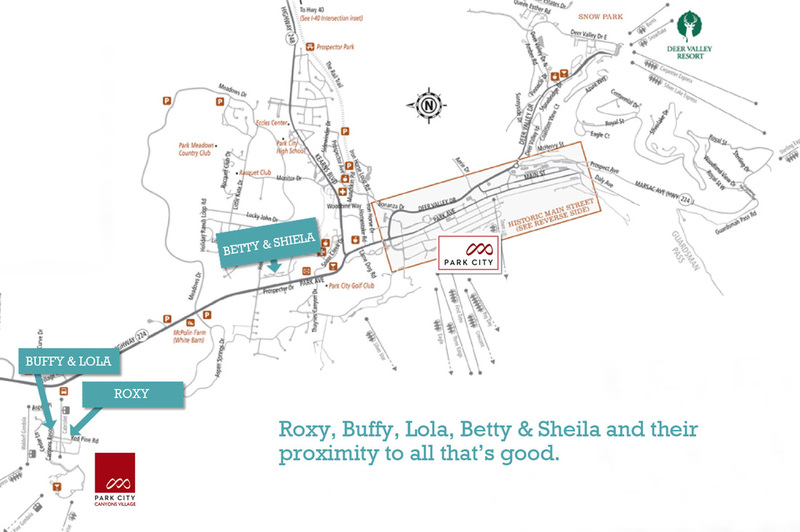 Betty is an easy walk with your skis or board to Park City's free shuttle bus line, offering easy access to Park City and Deer Valley resorts. Feel right at home in a skier's (or boarder's) paradise. At 2,250 square feet, Sheila offers a three-floor layout with two stone fireplaces, two big-screen TVs, and mountain views. 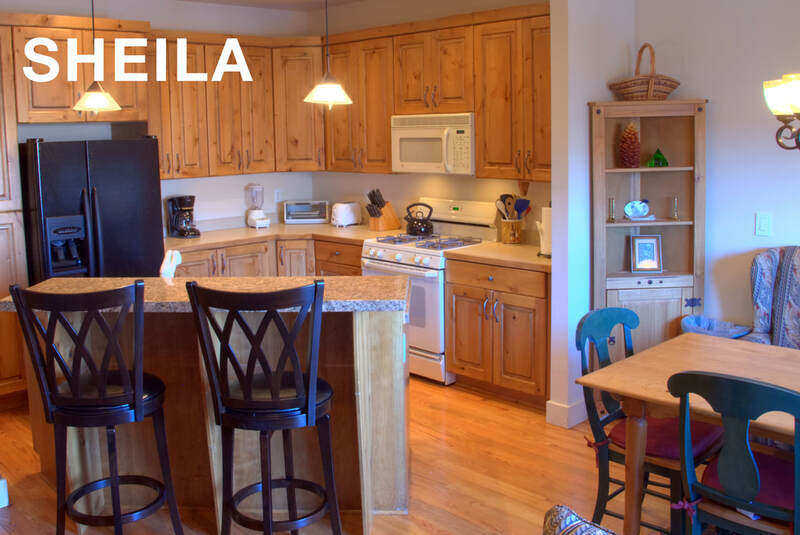 Sleeping as many as 11 people, Sheila offers everything you and your family need for a great winter sports get-away. 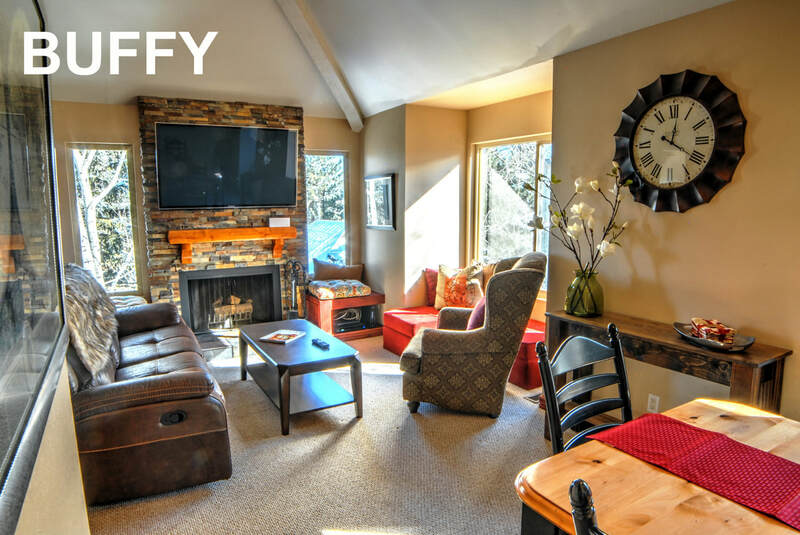 Via Park City's free shuttle buses, all four of these condos offer easy access to Deer Valley, Park City Mountain Resort's base area, and historic Main Street, making each an excellent central location from which to launch your Park City vacation.